Technology giant Apple has reported its first profit drop in a decade as rival smartphone-makers take a bite out of its business. Apple CEO Tim Cook has had a rough day. After months of speculation that the business would suffer following the death of co-founder and visionary Steve Jobs, it appears that the doom-mongers were spot on. 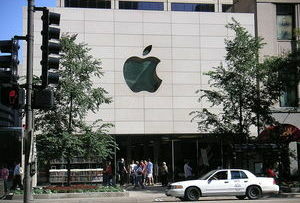 Apple has just reported a net profit of $9.5bn (£6.2bn) for the quarter to March 2012, down from $11.6bn in 2012. Gross margins have shrunk to 37.5% from 47.4% last year. Despite the vast numbers of units shipped over the last three months - 37.4 million iPhones and 19.5 million iPads worldwide - Apple is losing ground to its Korean competitor, Samsung, among others. Revenues hit $43.6bn for the period, an improvement on analysts forecasts but only a few million and change up from Q1. 'Though we've achieved a credible scale and financial success, we acknowledge that our growth rate has slowed and our margins have decreased from the exceptionally high level we experienced in 2012,' said Cook. Apple has been criticised in recent months over the dearth of innovative new gadgets rolling off the production line. New iterations of the iPad and iPhone have been just that, new iterations, not the 'next big thing'. 'The market is tired of the same old thing at Apple,' explains Lauren Balter, an analyst at Oracle Investment Research. As a result, Apple's share price has been steadily falling, losing almost 40% of its market cap since September last year and trading at a low of less than $400 a share last week. However, this latest drop in profits hasn't spooked investors as much as you would think. The rise in iPhone sales is evidence that Apple is still a major player in the smartphone industry, despite the popularity of rival Android phones. And then there's the company's enormous cash pile: 'There's $12.5bn in cash flow from operations during the quarter and an ending cash balance of $145bn,' revealed Peter Oppenheimer, Apple’s CFO. With numbers like that, it's not surprising that Apple's shares rebounded 5.5% in after-hours trading on Wall Street. During a call to journalists on Tuesday, CEO Cook attempted to quell fears that the age of Apple innovation had come to an end. There will be a lean few months, he explained, while the teams work on a range of new and exciting products. These will be rolled out in the autumn of 2013 and next year. 'The decline in Apple's stock price over the last couple of quarters has been very frustrating for all of us... but we'll continue to do what we do best,' he said. And Cook is certainly putting Apple's money where his mouth is. He is raising the dividend to shareholders by 15% and plans to buy back $60bn in shares. But is this truly evidence of Cook's faith in these mysterious new products? Or is he bluffing?